Cape Town — In an important step in the fight against strains of tuberculosis which resist conventional treatments, the U.S. Food and Drug Administration (FDA) has agreed to review urgently a new drug for approval. The introduction of the drug, called pretomanid, has shown promise in clinical trials for cutting the length of treatment for various kinds of drug-resistant TB down to six months. It can also be taken orally instead of by injection. Drug-resistant TB is difficult and costly to treat. Until recently, treatment for multidrug-resistant (MDR) TB has often taken nine to 18 months or more, and that for extensively drug-resistant (XDR) TB up to two years or longer. When the trials were launched, Dr Francesca Conradie of Sizwe Hospital in Johannesburg noted that XDR-TB in particular is “an absolute devastation to patients, their families, and communities”. The announcement of the FDA’s decision was made this month by the TB Alliance, a non-profit group based in New York and Pretoria which is dedicated to finding and making available better drugs to fight TB. FDA approval is an important step towards manufacturing and marketing drugs. The alliance said the FDA has accepted for review an application to use the novel drug as part of a three-drug regimen which also includes bedaquiline and linezolid. The FDA granted the drug “priority review” status, meaning that it aims to make a decision within six months instead of taking 10 months. The alliance expects a decision in the third quarter of this year and says if pretomanid is approved it will work with manufacturers to ensure that it will be accessible to everyone who needs it. The alliance said the three-drug regimen has been studied in 20 clinical trials, either alone or in combination with other anti-TB drugs. 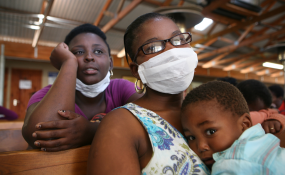 It was announced last October that nine of every 10 participants in trials at three South African sites had been cured of drug-resistant TB after six months of treatment and six months of post-treatment follow-up through a simplified and shortened treatment regimen.